What you need to know about air safety and crashes. Resumes Ready? FAA Says "We're Hiring!" SEYNE-LES-ALPES, France (AP) -- A cockpit voice recorder badly damaged when a German jetliner smashed into an Alpine mountainside and a crucial two-minute span when the pilot lost contact are vital clues into what caused the plane to go down, killing all 150 people on board, officials said Wednesday. Helicopters surveying the scattered debris lifted off at daybreak, hours ahead of the expected arrival of bereaved families and the French, German and Spanish leaders. The flight from Spain to Germany went into an unexplained eight-minute dive ahead of crashing Tuesday morning. Crews were making their way slowly to the remote crash site through fresh snow and rain, threading their way to the craggy ravine. On Tuesday, the cockpit voice recorder was retrieved from the site, French Interior Minister Bernard Cazeneuve said. "The black box is damaged and must be reconstituted in the coming hours in order to be useable," Cazeneuve told RTL radio. Key to the investigation is what happened in the minute after 10:30, said Segolene Royal, France's energy minister. From then, controllers were unable to make contact with the plane. The voice recorder takes audio feeds from four microphones within the cockpit and records all the conversations between the pilots, air traffic controllers as well as any noises heard in the cockpit. The flight data recorder, which Cazeneuve said had not been retrieved yet, captures 25 hours' worth of information on the position and condition of almost every major part in a plane. Royal and Cazeneuve both emphasized that terrorism is considered unlikely. Victims included two babies, two opera singers, an Australian mother and her adult son vacationing together, and 16 German high school students and their teachers returning from an exchange trip to Spain. The Airbus A320 operated by Germanwings, a budget subsidiary of Lufthansa, was less than an hour from landing in Duesseldorf on a flight from Barcelona when it unexpectedly went into a rapid 8-minute descent on Tuesday. The pilots sent out no distress call and had lost radio contact with their control center, France's aviation authority said. Germanwings said 144 passengers and six crew members were on board. SEYNE-LES-ALPES, France -- Crews began a second day of searching on an Alpine mountainside where a German jetliner crashed with no distress call Tuesday, apparently killing all 150 people on board. Helicopters resumed flights Wednesday over the field of widely scattered debris, hours ahead of the expected arrival of bereaved families and the French, German and Spanish leaders. Crews were making their way slowly to the remote crash site through fresh snow and rain, threading their way to the rocky ravine. Interior Ministry spokesman Paul-Henry Brandet said the overnight precipitation made the rocky ravine slippery, increasing the difficulty of reaching the steep area. On Tuesday, the cockpit voice recorder was retrieved from the site, French Interior Minister Bernard Cazeneuve said. The two "black boxes" - actually orange boxes designed to survive extreme heat and pressure - should provide investigators with a second-by-second timeline of the plane's flight. The voice recorder takes audio feeds from four microphones within the cockpit and records all the conversations between the pilots, air traffic controllers as well as any noises heard in the cockpit. The flight data recorder, which Cazeneuve said had not been retrieved yet, captures 25 hours' worth of information on the position and condition of almost every major part in a plane. Germanwings Flight 9525, from Barcelona, Spain to Duesseldorf, Germany, went into an unexplained eight-minute steep descent that culminated with the crash. Germanwings is a budget subsidiary of Lufthansa, Germany's biggest airline. The parent company is, for now, calling the crash an accident. The Airbus A320 was less than an hour from its scheduled landing when it began the descent. France's aviation authority said the pilots did not send out a distress call and had lost radio contact with their control center, deepening the mystery. Meanwhile, flowers were piling up in front of a Germany high school where 16 of the passengers were 10th grade exchange students. Students gathered for a service, crying and hugging one another over the loss of their classmates. The majority of victims were European. Germany and Spain are believed to have lost the most lives in the crash. Two of the passengers were Australian. The Japanese government says two of its citizens were on board as well. Two babies and two opera singers were on the plane. While investigators searched through debris on steep and desolate slopes, families reeled with shock and grief. Sobbing relatives at both airports were led away by airport workers and crisis counselors. "The site is a picture of horror. The grief of the families and friends is immeasurable," German Foreign Minister Frank-Walter Steinmeier said after being flown over the crash scene. "We must now stand together. We are united in our great grief." It took investigators hours to reach the site Tuesday, led by mountain guides to the ravine in the southern French Alps, not far from the Italian border and the French Riviera. Video shot from a helicopter and aired by BFM TV showed rescuers walking in the crevices of a rocky mountainside scattered with plane parts. Photos of the crash site showed white flecks of debris across a mountain and larger airplane body sections with windows. A helicopter crew that landed briefly in the area saw no signs of life, French officials said. "Everything is pulverized. The largest pieces of debris are the size of a small car. No one can access the site from the ground," Gilbert Sauvan, president of the general council, Alpes-de-Haute-Provence, told The Associated Press. "This is pretty much the worst thing you can imagine," said Bodo Klimpel, mayor of the German town of Haltern, filled with grief after losing the 16 students and their two teachers. The White House and the airline chief said there was no sign that terrorism was involved, and German Chancellor Angela Merkel urged reporters not to speculate on the cause. "We still don't know much beyond the bare information on the flight, and there should be no speculation on the cause of the crash," she said in Berlin. "All that will be investigated thoroughly." Lufthansa Vice President Heike Birlenbach told reporters in Barcelona that for now "we say it is an accident." In Washington, the White House said American officials were in contact with their French, Spanish and German counterparts. "There is no indication of a nexus to terrorism at this time," said U.S. National Security Council spokeswoman Bernadette Meehan. Merkel, French President Francois Hollande and Spanish Prime Minister Mariano Rajoy were to visit the site Wednesday. Germanwings serves mostly European destinations. Tuesday's crash was its first involving passenger deaths since it began operating in 2002. The Germanwings logo, normally maroon and yellow, was blacked out on its Twitter feed. Lufthansa CEO Carsten Spohr called it the "blackest day of our company's 60-year history." He insisted, however, that flying "remains after this terrible day the safest mode of transport." Contralto Maria Radner was returning to Germany with her husband and baby after performing in Wagner's opera "Siegfried," according to Barcelona's Gran Teatre del Liceu. Bass baritone Oleg Bryjak had appeared in the same opera, according to the opera house in Duesseldorf. The plane left Barcelona Airport at 10:01 a.m. and had reached its cruising height of 38,000 feet when it suddenly went into an eight-minute descent to just over 6,000 feet, Germanwings CEO Thomas Winkelmann told reporters in Cologne. "We cannot say at the moment why our colleague went into the descent, and so quickly, and without previously consulting air traffic control," said Germanwings' director of flight operations, Stefan-Kenan Scheib. At 10:30, the plane lost radio contact with the control center but "never declared a distress alert," Eric Heraud of the French Civil Aviation Authority told the AP. The plane crashed at an altitude of about 6,550 feet at Meolans-Revels, near the popular ski resort of Pra Loup. The site is 430 miles south-southeast of Paris. "It was a deafening noise. I thought it was an avalanche, although it sounded slightly different. It was short noise and lasted just a few seconds," Sandrine Boisse, the president of the Pra Loup tourism office, told the AP. Authorities faced a long and difficult search-and-recovery operation because of the area's remoteness. The weather, which had been clear earlier in the day, deteriorated Tuesday afternoon, with a chilly rain falling. Snow coated nearby mountaintops. Brandet, the French Interior Ministry spokesman, said the crash site covered several acres, with thousands of pieces of debris, "which leads us to think the impact must have been extremely violent at very high speed." Winkelmann said the pilot, whom he did not name, had more than 10 years' experience working for Germanwings and Lufthansa. Florian Graenzdoerffer, Lufthansa spokesman for North Rhine Westphalia, said the company had to cancel seven flights out of Dusseldorf because a number of crew members felt they were unfit to fly following news of the accident. "I can't tell you any details because this is a personal decision and in our business we have an agreement if a crew feels unfit to fly ... then we respect this," Graenzdoerffer said. The aircraft was delivered to Lufthansa in 1991, had approximately 58,300 flight hours in some 46,700 flights, Airbus said. The plane underwent a routine check in Duesseldorf on Monday, and its last regular full check took place in the summer of 2013. The A320 plane is a workhorse of modern aviation, with a good safety record. 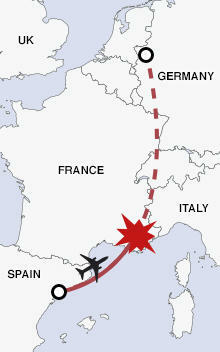 The last time a passenger jet crashed in France was the 2000 Concorde accident, which left 113 dead. American and European regulations generally prohibit pilots from taking pictures while flying planes, and for good reason: sometimes the camera does get in the way of safe flight - literally. An investigation in the UK has found that a military airliner took a terrifying 4,400 foot nosedive last year after the pilot's DSLR got stuck next to the plane's joystick. The Daily Mail reports that Military Aviation Authority has just released a report on the February 9th, 2014, incident that involved a RAF Airbus A330 transport jet carrying 198 people. After examining the evidence, the investigators concluded that on the way to Afghanistan, the captain had shot a total of 77 photos of the flight deck from his seat. Just three minutes after taking a picture, he moved his seat forward, causing the Nikon camera to fall into the space between his armrest and joystick and become wedged. The plane then took a nosedive for 27 seconds, losing 4,400 feet during that span and causing injuries to 33 of the passengers and crew. The report concludes that the case was a "near-miss" that had "realistic potential for the loss of the aircraft and 198 of our people." Although the military pilot was not prohibited from using his camera during the flight - and in fact the photography may have helped him be alert during times of boredom - this incident will soon lead to new rules that prohibit things from being placed between the armrest and joystick. Planes are considered the safest mode of transport, and for good reason. Statistically, accidents occur at a rate of 0.23 per million flights. Below, 10 important facts about civil aviation. 1. 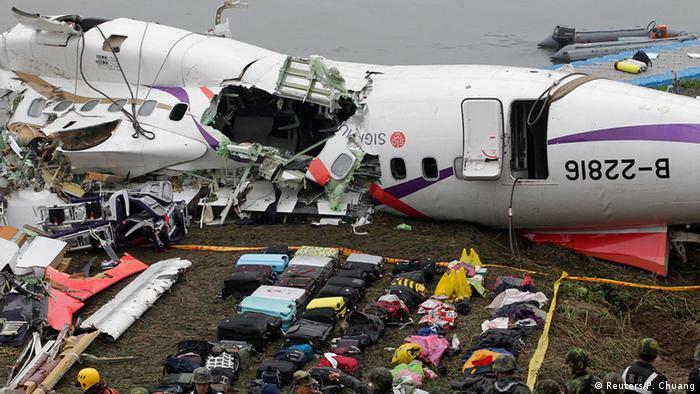 In terms of fatalities, 2014 was the worst year in the history of civil aviation. Some 970 people died in plane crashes. 2. The three accidents with the highest number of fatalities were connected to two airlines based in Malaysia. 3. However, more than 3.3 billion people flew safely in 2014, according to the International Air Transport Association (IATA). That represents 170 million more tickets sold than in 2013. 4. The highest number of civilian aviation fatalities on or over German territory in the last 40 years was in 2002, when 118 people died. 5. The lowest number of fatalities on German territory was in 2004 with 23 deaths. 6. Europe's biggest airplane disaster happened on the ground at Spain's Tenerife airport on March 27, 1977. A KLM flight tried to take off while a Pan Am flight was still on the runway. The collision killed 583 people. 7. Malaysia Airlines Flight MH17 is considered to be one of the most tragic flight disasters in recent memory. The flight from Amsterdam to Kuala Lumpur crashed after supposedly being shot down over a war zone in East Ukraine. Many children were among the 298 dead. 8. Large airlines are seldom involved in fatal accidents. Regional carriers with smaller planes have a higher accident rate. Most of these are based outside of Europe and the Americas. 9. Civil aviation is a growing market. IATA estimates that in 20 years, around 7.3 billion people will travel by plane annually. That's double the number seen in 2014. According to reports, Spicejet Ltd has announced that five aircraft-leasing entities based in Ireland have terminated their agreements and have gone to court to recover dues. The matter is expected to come up for hearing on Wednesday, says report. Media report said that B&B Air Acquisition, Steddell Ltd, Torodell Ltd, Xavierdell Ltd and Virgodell Ltd had leased aircraft. This move comes after the Delhi High Court ordered de-registration six aircraft chartered by SpiceJet. The council expected about a hundred people to speak out about the future of the airport - a contentious issue that has the city divided. Harrison Ford's recent plane crash is putting Santa Monica's airport at the center of a heated debate, as neighbors are strongly push for the airport to close down. Opponents of the Santa Monica Airport are rallied outside Santa Monica City Hall Tuesday night in advance of a city council meeting. The future of the Santa Monica Airport is literally up in the air as the city council plans to vote on how the facility should be operated moving forward. Opponents want the 227-acre airport shut down altogether, citing pollution, noise and safety. They cite 11 crashes of planes coming or going from Santa Monica airport since 1989 - the most recent being actor Harrison Ford's crash on Penmar Golf Course. "The Harrison Ford crash was the crash heard round the world," said Alan Levenson, who lives near the airport runway. He is among those who planned to attend the city council meeting to complain about safety. Officials said the meeting may last until after midnight. "There's too much risk here to have a plane 300 feet from houses on both ends," Levenson said. The city of Santa Monica's agreement with the federal government for the use of the land expires July 1. Lawsuits are pending over what will happen to the land after that. airport indefinitely, but the city believes it has the right to limit operations. But airport supporters say the airport is needed during natural disasters, and if the airport is shut down air traffic from LAX would be allowed to fly lower over Santa Monica - and high rise buildings could go up along the shoreline. Pilot Christian Fry says the airport needs to remain operational. "The anti-airport people are fear mongering. We've never killed a Santa Monica resident in 100 years of operation that wasn't in a plane," he said. Some career fields at the agency are well known, such as air traffic controllers. As I've reported in the past, the FAA is set to hire 10,000 controllers over the next decade, with more than 6,000 in the next five years. Some were hired last year but it is anticipated that additional hiring opportunities will be made available next week. Air traffic control jobs last year were open to the general public and did not require specific aviation training. This resulted in significant controversy as air traffic control college students in the past had received priority. [Disclosure I teach at Vaughn College which has an air traffic control program.] It is not clear at this time whether there will be any change in hiring based on criticisms from last year. In addition to air traffic controllers, the FAA also employs specialized electronics technicians called technical operations specialists who "install, evaluate, maintain, modify and certify" facilities, services and equipment that support the national airspace system. This includes radar, weather and other electronic systems that assist controllers and pilots flying in the United States. Other jobs include aviation safety inspectors who generally have years of experience in aviation as pilots or mechanics. Information on these and other career fields is available on the FAA's jobs website. *	Tour of Boeing's South Carolina Facility. In Charleston, Boeing fabricates, assembles and installs systems for aft (rear) fuselage sections of the Boeing 787 Dreamliner and joins and integrates mid body fuselage sections. The site is also home to the company's newest 787 Dreamliner final assembly and delivery facility. Should you have any questions, please contact Tammy Washington, NSC Staff Representative at or 630-775-2227.